Summer is still slowly roasting, but back to school is looming, and before you know it fall will be here. That means lots of fun Hallowe’en and autumn foliage inspirations, warm colors, more room for statement jewelry and just a treasure trove of opportunities for amazing beadwork. 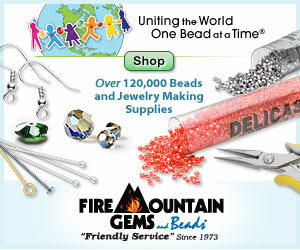 Our fellow bead lovers at PandaHall.com want to help jump-start your fall projects with a gorgeous selection of beads and charms that are sure to inspire. They have a huge lineup of materials in glass, gemstones, metals, pearl, wood, bone and much more. One Inspirational Beading reader will win a sampling of some of their favorite beads for this season including: faceted abacus glass beads, large hole acrylic pumpkin spacers, and two-tone faceted round jade beads in multicolor mixes, plus a selection of adorable Hallowe’en silver-tone alloy pendants. For a chance to win a sampling of all of the beads shown, visit PandaHall.com and check out their selection of beads, findings, and beading supplies. Then leave a comment on this post letting us know what some of your favorites are. One lucky winner will be drawn on Friday, August 7th. This giveaway is open to readers from Canada and the US. Important: Please make sure to leave a comment directly on InspirationalBeading.Blogspot.com to enter. You do not need an account to comment, but please make sure to provide an email address or contact method in your comment or profile so that I can reach you if you win! Incomplete or duplicate entries will not be included in the draw. This week I received some advanced copies of Ancient Worlds Modern Beads, and I couldn’t be more excited. The official release date is just a few short months away, and I’m looking forward to being able to search book shops for copies. It’s been an incredible journey and a dream come true! Thank you again to all of you for your support over the past few years while it all came together. I put off taking a good look through the pages of Ancient Worlds Modern Beads – I was hoping a little distance from the last editing session would help me to see it through a reader’s eyes. It’s a bit tough, since I’ve got all of the featured pieces sitting right here with me – what a strange thing to be able to see them both together! I hope that the projects help to inspire many more. Meanwhile, I’ve been trying to find the right balance of work, family, and beading. We’re right in the middle of summer vacation, so almost any free time I’ve got has been going to fun outings, or just plain old sleeping in. I hope that once school gets going again, I can hammer out a much better schedule that will include lots of beadwork and related goodness. After weeks of head scratching, I’ve finally solved the shop dilemma that’s been keeping me from finding homes for new jewelry designs. ArtFire has made some major changes this year, including placing ads on listing pages and offering an ad-free account with a commission. I had hoped to start a brand new shop, but I have no idea when I’ll have the time to commit to such an endeavor. Once ArtFire announced that they would accept PayPal – aka shop profits – as payment for fees, I decided I would just go ahead and continue using the site until I can migrate to something else. This works out nicely, since I have a lot of business cards to go through before I can change my links! I’ve committed myself to adding a few new designs to my shops each week if I can find the time, and I’ll have to pull my socks up to really get things done. My workspace has become a bit of a disaster area again – it’s just so hard to spend time filing beads when I can be weaving with them instead. How are you juggling hobbies and summer activities right now? Actions you take from this page may result in a commission for Inspirational Beading. I’ve been soaking up some summer sun these past few weeks, and although I’ve been doing a lot of relaxing, I have managed to get some beading done, too. Right now I’m working on a new variation of the Potawatomi chains I was playing with awhile back, with some new chevron patterns that are rapidly becoming a personal favorite. One thing I really like about this stitch is how quickly it all comes together, even with a bit of pattern thrown in. I find that work and summer vacation have scrambled my creative side a little bit, so I’m not sure exactly what I’ll be working on when this piece is complete. I do know that I’ve been missing just getting out the beads to play, so hopefully new inspirations will strike soon. I’m just settling in after a mini vacation this week, and putting the final touches on the new primary colors cuff. The palette is so fun and summery, and with a traditional bead and loop closure, it’s feeling very much like a grown-up summer camp project. I'm working a lot more this summer than I'm used to, so any little splash of sunshine is welcome! Days seem to be zipping by much faster than I’d like, and I’ve decided to postpone opening a new jewelry shop. I just don’t have time to start from scratch, but if I don’t do something all of my designs will be sitting in a box collecting metaphorical dust. I’m going to fall back on my existing shops for now, and perhaps migrate at a later date. I’m almost finished with this year’s stash clean up. My bead collection is starting to look really polished and much more ‘me’ than ever before. I’ve got quite a few destash beads to giveaway yet, and this month it’s all about the beach (again!). This prize pack includes a big handful of lovely cowry shells that are perfect for hemp jewelry and mixed media projects, plus a dollop of pretty mother of pearl chips. I’ve had some really great times working with these beads, but it’s time for them to find a more worthy home. For a chance to win all of the beads shown, leave a comment on this post letting us know what your favorite beach-themed bead palette is. One lucky reader will be drawn on Tuesday, July 14th. This giveaway is open to readers in Canada and the US. Important: Please make sure to leave your comment directly on InspirationalBeading.blogspot.com to enter. No log-in is required, but please make sure to leave an email address or contact link in your comment, so that you can be reached if you win. Incomplete or duplicate entries will not be included in the draw. I’m just about to start a new cuff bracelet with a very exciting palette of opaque crayon colors, plus a dash of black and white stripes. With all of these rainbow and chromatic inspirations coming my way, I’m really missing have more orange in my stash, but I’ll have to make due until the next seed bead stock-up. So far I’m more than happy with the way things are turning out, so there's no rush. I’m also playing around a bit with some vintage millefiori beads that I picked up while thrifting for new summer garments. (The star of the trip was a new handbag in my favorite color – chartreuse!) 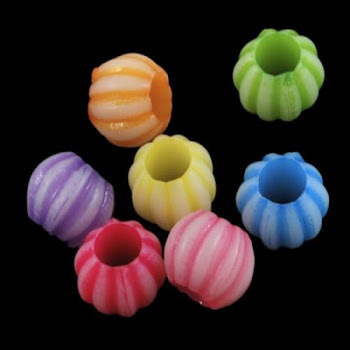 I’m looking forward to seeing what these little beads can do, though the oblong shape might make them a little tricky to incorporate into my favorite designs. At last my mission to find new inspirations is complete with the arrival of my first bead order of the year. I didn’t spend a whole lot, and did a bit of stocking up on important elements like jet black 8/o seedbeads and Fireline, but there are some pretty exciting new beads in my stash now as well. My absolute favorite grab from this haul is a pair of dyed horn rondelles in red and amber. 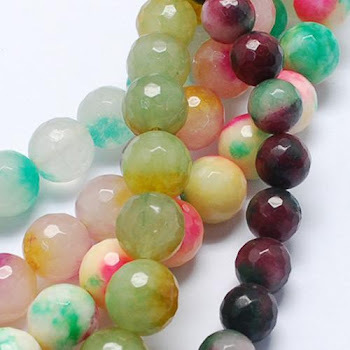 I first tried these natural beads in a round shape last year, and I absolutely fell in love. The natural translucent finish and warm colors are so fantastic, and perfect for the designs I like to make. I can’t wait to start using these! I also picked up a few things that were on sale and just called to me for the fun of it, including a big bag of carved mother of pearl butterfly pendants. I have no idea what I’m going to do with them, but there were some pretty great colors in the bag, including these turquoise, lime and black pieces. Now I feel pretty much back on track, and I’m ready to start creating at my normal pace again. Although I’ll be working a lot throughout the summer – not to mention spending time at the beach – I know I’ll be able to make time for beading and sharing ideas, too. It’s good to be back! Do you like to try out new beads for inspiration? What styles do you tend to go for? This week I’m working on two very different but equally fun projects with nothing but seed beads. One is an experiment with patterns in Potawatomi chain, starting with some simple stripes and hopefully getting even more elaborate from there. The palette is pretty simple with black, white, red, and turquoise, which makes playing with the patterns really fun. I’m always thrilled with the way this stitch comes together – it seems so complicated at first but reveals itself with just a few stitches. I’m also making a new bracelet with some rainbow panels and a lot of lovely transparent mint. Since I don’t have any opaque purple – they tend to be coated and never stand up to wear – I’ve used turquoise and cobalt for the final colors in the pattern and it has pretty much the same effect as your average rainbow.